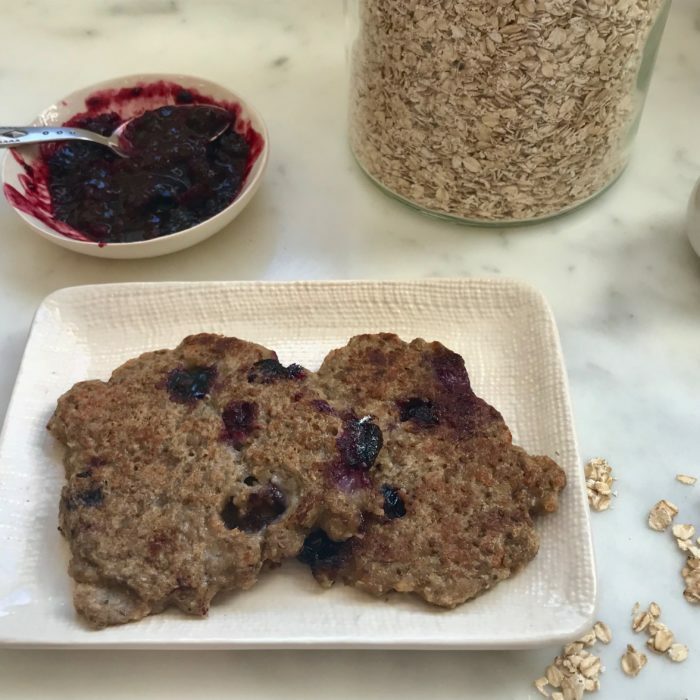 A tasty power breakfast that the kids like can be a challenge sometimes, especially on week days. I find that pancakes are easy because I can either make the batter or the actual pancakes the night before. Combine all the ingredients for the the pancakes and start by adding just 1/2 cup of the milk to check the batter consistency. Judge if you like it thicker or not to add more milk or not. Stir in the blueberries and scoop 1/4 cup of the batter into a hot pan with coconut oil and cook for 3-4 minutes on each side. ( I like to add chia seeds, or flaxseed meals also sometimes to add a healthy boost for the kids or myself). Meanwhile combine the berries and water in a pot, bring to boil and simmer for a couple of minutes until cooked and mushy. Feel free to add cinnamon and maple syrup and even some orange zest. Scoop some of the compote on top of the pancakes and enjoy!